The Bradford Amateur Rowing Club (BARC) is a British Rowing affiliated club in Saltaire, West Yorkshire. The Club’s 2016 Autumn Regatta took place on the beautiful stretch of the River Aire on the 10 September. It was a great success, blessed with some wonderful weather. 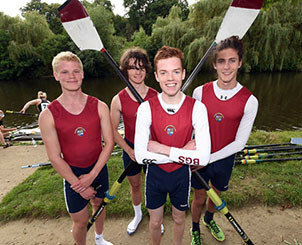 Bradford Grammar School (BGS) entered several crews despite the fact that they had not been on the after training since the end of the Summer term. The Junior 18 coxed four of Tom Bradley, Nick Keating, Christian Burke [J16], John Burke and Matthew Parry [cox] defeated two other crews to win the IM2 coxed fours event for Seniors. The Junior 18 double scull of Euan Adam and Ben Wood defeated another Bradford Grammar crew of John Burke and Will Robson in a thrilling Final.